Duuuuuuuun, dun…Duuuuuuuun, dun…Dududududududududududududu…Dudunnnnn!!! Your friends won’t believe you aren’t there to ruin their summer vacation, or that they won’t need a bigger boat! 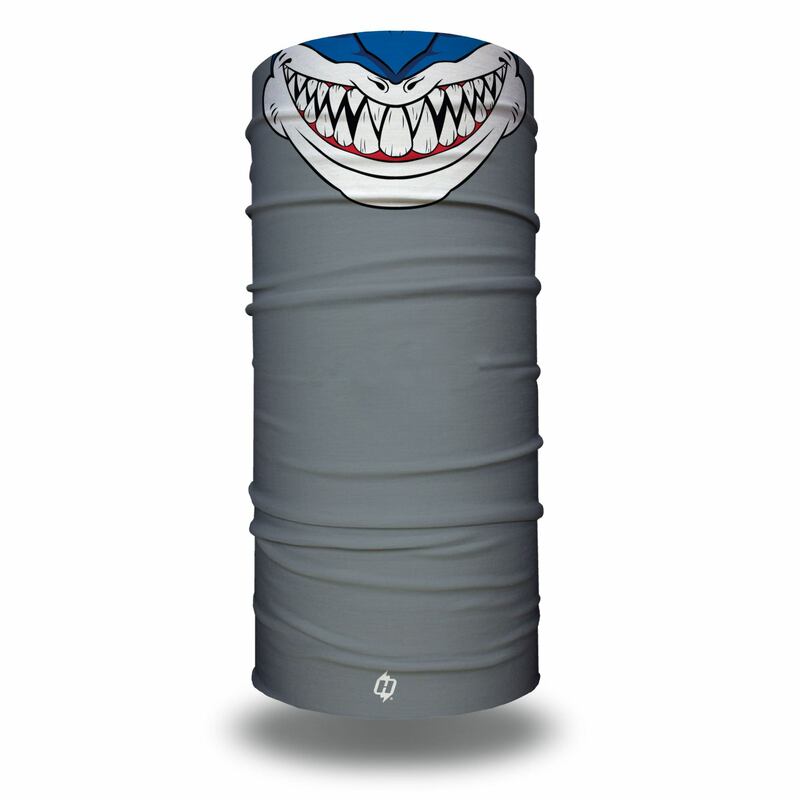 This shark eating grin reminds us of a favorite movie and we had to put it on a face mask. Hop in your boat and hook something today! It looks exactly like the photos, it’s awesome! Great fit and very versatile! I’ve got over 10 Hoorags and this one is my favorite! This is the one I wear when I’m bass fishing. 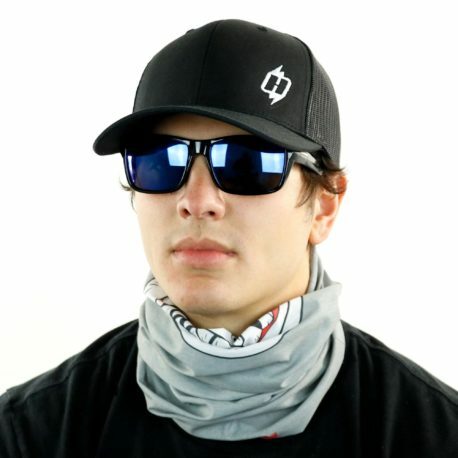 It does amazing at covering the neck and ears. Not to hot either it breathes very well. Highly recommend! 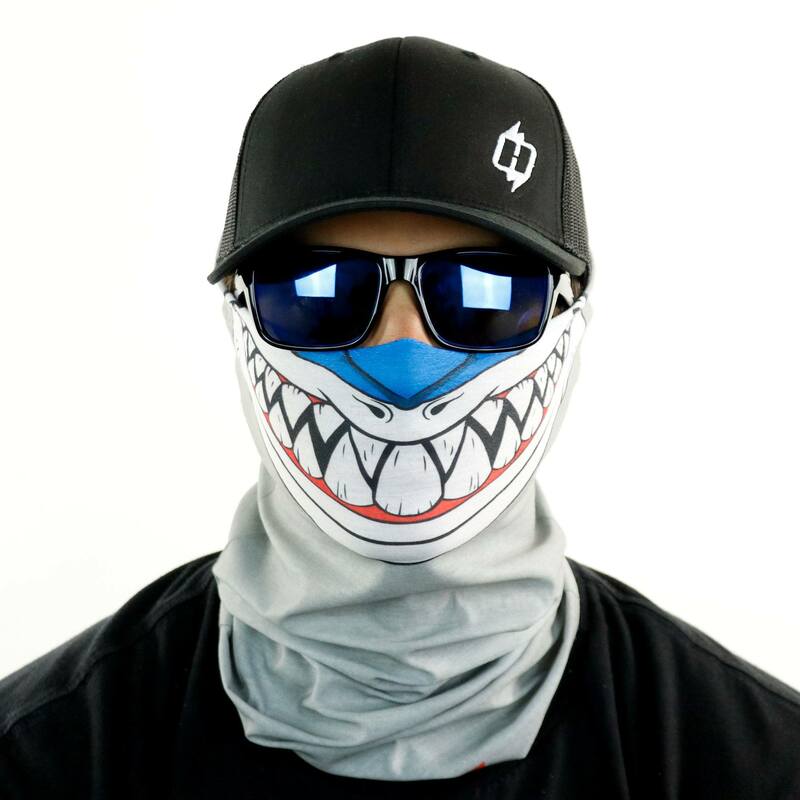 product was better than anticipated, does a good job of covering neck and face. first one ive ever owned. love it. it actually keeps your face warm going down the lake better than i thought it would. will buy another. Pretty great, the only I would change if I could is I would lower the jaws to add more blue to the top as it tends to curl in on itself, but other than it curling a little bit this thing is Jawsome! I love wearing it like a beanie and just randomly walking up to people to quote Deepest Bluest by L.L. Cool J.
I love it and wear it everywhere I go, I always wanted something like this and it’s just perfect. It stretches too and can’t go wrong with the design. I noticed the top curls in on itself a tiny bit but that happens with any hoorag I’m sure and it’s no big deal. Thanks for the awesome product guys and can’t wait to order more sometime! Great price, Great product and SO COOL LOOKING! Get a lot of thumbs ups on the water when they are up. These are not only good for the sun rays, but they are awesome to fight against the knat’s and mosquito’s that love to buzz your eyes ears and nose. No more problems swatting bugs, now I just fish and have fun! Design rocks, light, and you can wear it anywhere. Love the design on this. This is my third Hoo-rag and I love them. I even ordered them for my wife and daughter for Christmas. I really love the design but I got this and the skull daddy. The skull daddy is perfect. But this one did not fit nearly as well. I can’t wear it honestly. Still an amazing product if it worked im just bummed a lil that my favorite of the two doesn’t fit me. We strive to ensure consistency within our product process. It is possible that the Skull Daddy you received was printed under our old controls. The chumster and any new product being created should be a more consistent 9.5 inches wide. We are sorry to hear this is not a comfortable size for you. Should you wish to return the Chumster for a refund please reach out to us via email at orders@hoorag.com.